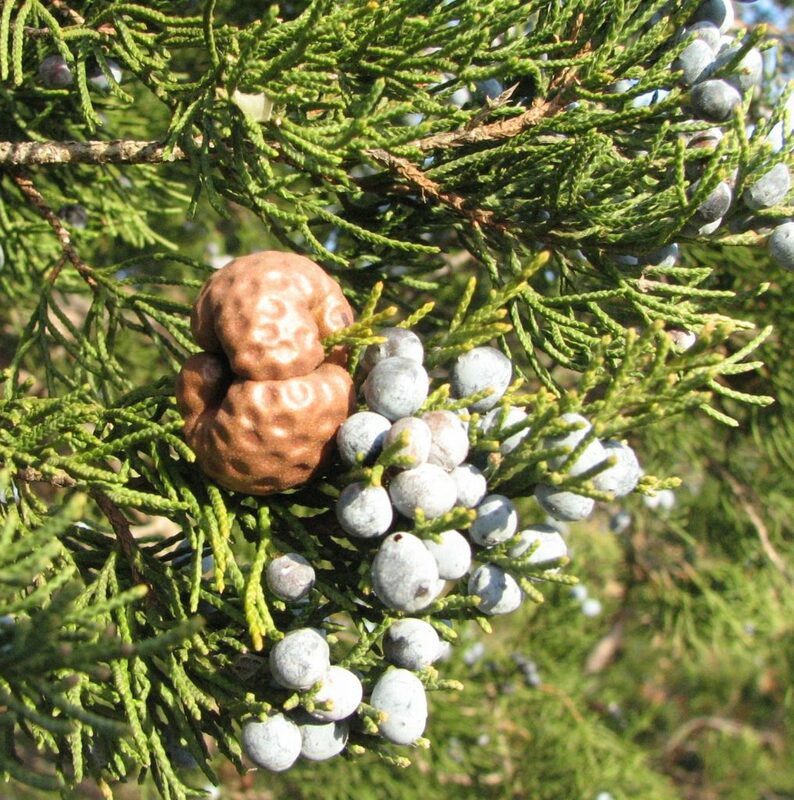 Juniperus virginiana is an evergreen conifer tree to 20 m tall; habit upright, narrow; taprooted in deep soil; fibrous, wide spreading roots in shallow, rocky soil; bark brown, shredding. Leaves: evergreen, scale-like, tightly overlapping, juvenile leaves needle-like. Flowers: none. Dioecious; male cones small yellow-brown on branch tips in winter, wind pollinated; March-May. Fruit none. Female cones fleshy, blue-waxy, berry-like, about 0.6 cm wide; aromatic; 1-2 seeds, Sept.-Nov.; seed load 25%; pulp nutrients: water 48%, lipid 7%, protein 4%, CHO 43% (White 1989). Cones eaten and seeds dispersed by birds and mammals, including bears, raccoons, coyotes, foxes, and opossum, through winter (Martin et al. 1951; Wilson 1993). Seeds not viable for more than one year. Almost 75% of dispersal occurs within 12 m of the parent tree (Holthuijzen and Sharik 1985; Holthuijzen et al. 1987). Juniperus virginiana cones and leaves.commons.wikimedia.org (Accessed 5/2014). Habitat: Successional tree in open uplands, old fields, roadsides in Staten Island but may persists decades under closed canopy of successional woodlands. Typical of old fields and back dune coastal woodlands (Sandy Hook, NJ). Easily damaged by fire. Tolerates soil pH 4.5-7.8 (8.5), but rather intolerant of soil pH over 7.8. Moderately tolerant of salt, tolerant of drought, pollution. Intolerant of flooding, soil compaction, shade, index 0-2 (Hightshoe 1988). Gymnosporangium_juniperi-virginianae .gall and Juniper cones.commons.wikimedia.org (Accessed 1/2017). Notes: Twigs and leaves eaten by deer in winter (Martin et al. 1951). Foliage eaten by larvae of bagworm moths (Thyridopteryx ephemeraeformis, Psychidae), and spruce spider mites (Oligonychus ununguis, Arachnida, order Acarina). Trees weakened by insect damage or stress attacked by root rot fungus Heterobasidion annosum, (Fomes sp. ; Basidiomycotina). Foliage and twigs attacked by blight (Cercospora sequoiae, Deuteromycotina) and cedar-apple rust (Gymnosporangium juniperi-virginianae; Basidiomycotina) forming bright orange, horn-shaped, gelatinous out growths that release spores. Dead galls dry into blackish knots. Perennial galls of hawthorn-cedar rust gall (G. globosum) form shorter orange gelatinous growths, dry, living galls are reddish-brown. Both infect apple trees (Burns and Honkala 1990; Sinclair et al. 1987; Agrios 1988; Borror and White 1970). 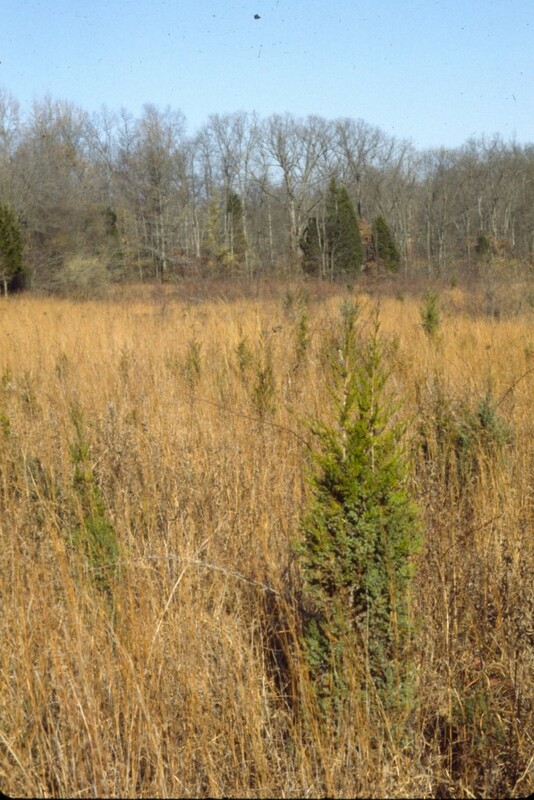 L. Photo: Juniperus virginiana.old-field,M. B Gargiullo 1991.R. 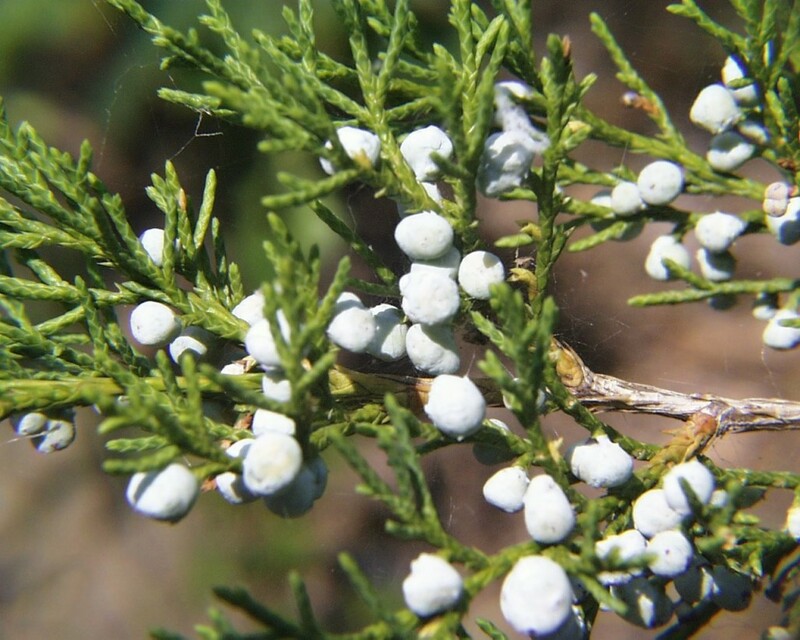 Photo: Juniperus virginiana.commons.wikimedia.org. (Accessed 9/2014).